In 1950s Hollywood, Eddie Mannix is Capital Pictures' head of physical production and, most importantly, the studio fixer. His job is to maintain the clean reputation of the company and its stars, keeping them free from controversy. 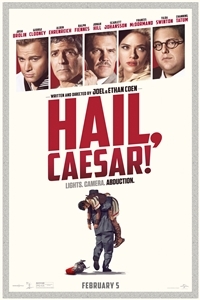 Mannix is advised that studio star Baird Whitlock has disappeared after not showing up for work on the current production of "Hail Caesar, a Tale of Christ's Life." He initially believes Whitlock has been drinking, but receives a call from a group of communists who claim to have kidnapped him and want a ransom. As Mannix gathers the cash, he simultaneously deals with an unhappy director who is working on another project, while innocent young starlet DeeAnna Moran is pregnant and unmarried. Mannix must handle all of this while keeping the gossip columnists off the scent. When Mannix is approached by an aviation company with an offer of a less-hectic, and rather lucrative, job, he must ultimately determine his true skills and passions.